On my last visit to the laboratory in Hadera Paper Mill to check the properties of new papers for these articles, I took along some Bible paper I got a few years ago from an unknown producer. To my surprise, Avi, our contact at the mill, said: "We just started making Bible paper. Do you want some?". Of course I said yes! 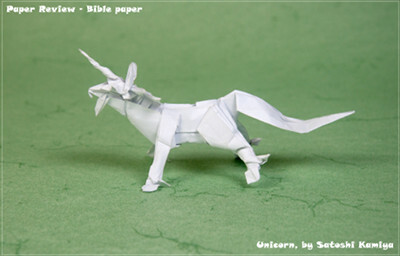 This paper is called Bible paper (a.k.a. Indian paper) because it is used to print the bible and many other holy books. As these books all have a great many pages and expect frequent use, the paper must be: light in order to be handled easily; thin to allow more space on your shelf; strong and durable to last longer; and very importantly - opaque. You don't want to see the letters from the other side when you read it. But paper that is thin and light is very often translucent - a contradiction which must be overcome. It should also have an extremely smooth surface to allow clean and sharp printing. 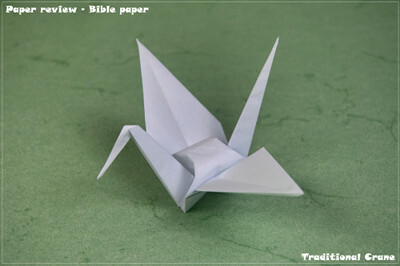 Consequently bible paper usually weighs between 40 and 45gsm, and no more than 50gsm. To achieve this standard of paper, the manufacturer uses longer fibres, which will result in stronger paper, and reduce the density of the pulp-to-water mixture which leads to a lower weight (gsm). Sometimes it will also be pressed in a calendar with a series of hard pressure rollers to get a smooth finish. This is what they do at the Hadera Paper Mill. This specific paper is acid free, wood free, and that is all I know about it. Hadera is proud of its highly opaque and clear white properties and will not share the secret. I do know they add some colors to get the right tint of white. 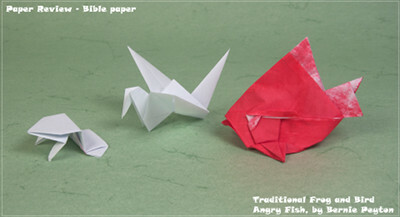 So, a thin, smooth, strong and durable paper - sounds like a good starting point for an origami paper. Thickness: The measured weight is 50 gsm. The thickness measurement is 62 microns; this is on the left side of the scale, a little thicker than Kraft and Onion Skin papers, but similar to ordinary kami. Sizes: This paper is mostly available in A4 sheets, and up to full sheets of B1 (39.4×27.8in). Colors: Three shades of white are available: white, off white, and cream white. Paper Coloring or Colorability: Applying water color resulted in some curving and rippling, which was expected. However, the color was very quickly noticeable on the other side, so there is no point in trying to make a duo color sheet with it. There was no change in the size or proportion of the paper after it had dried. Texture: Smooth to the touch. It has a fabric-like feeling, a little silky. Photogenic: It is a white paper. The silky finish gives it a slight "high end" look, but nothing more than that. Aging and Wear and Tear: This paper is meant to last. It's acid free, which is a must if you want your bible or archives to last for many years. It also resists tearing, requiring considerably more effort than normal printer paper. 8 out of 10. Memory: Not the best. I tried the Preliminary-to-WaterBomb test (popping from one base to the other) and the paper only changed a little. You can feel crease, but only just. 7 out of 10. Forgiveness: Better than expected. Just do it slowly and there is no problem in reversing a fold line. 7.5 out of 10. Tensile Strength: We refer here to the maximum stress the paper can undergo while being stretched or pulled. With the grain, the paper can hold up to 4.6kg before tearing, but only 1.9kg against the grain. Those numbers are a bit better than Onion Skin paper. It is a good result for such a thin paper. 8.5 out of 10. Bending Resistance: This section rates the amount of force you need to apply to get a sharp crease and how strong the paper is while being curved. It's a thin and weak paper, and can hardly hold a posture. Still, it does hold it. 6 out of 10. I am sure any printing press you visit will have a stock of this paper, and allow you some sheets. Nothing special here, neither good nor bad. It's solid enough at this size and folded well. This paper works well for pull mechanisms, not so much for push action models. Coming back from the AEP convention, I had a new action model to test the push mechanism – the angry fish! Folding the fish wasn't easy, as it required reversing some sharp angles. I was successful with blowing up the fish. But trying to open the mouth by pushing the tail resulted in disappointment, as the paper tore and the fish stayed silent! The flapping bird flaps constantly with even movements of the wings. There were no signs of tear or fatigue in the paper; the wings kept coming back to the desired position again and again. The frog jumps happily, but I had to use small paper and take into account the grain. 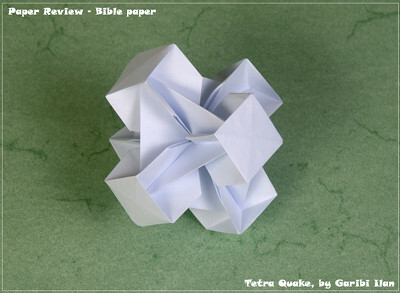 Bible paper is surprisingly suitable for tessellations. Folding the grid went surprisingly well, since I expected the paper to be "fluffier" than it was. Against the grain it is easier to reverse all folds. The precreasing for the pattern also went well. Even though we used thicker than regular Bible paper, this version is thin enough to be multi-layered during the collapse. The thicker paper also supplies the resistance you need for popping the paper into place. The first stage of the collapse went smoothly. For the second stage of the collapse, I braced myself - it is much harder to make correctly, as the paper must twist and stretch to get to the right place. Again, it came out pretty well, and without any real problems. The final result is sharper than usual, flat and satisfying. Back lighting white paper always looks good. Folding the grid was quick and uneventful. 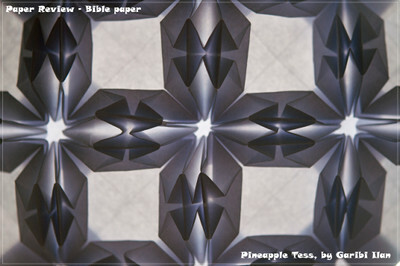 With this tessellation there are no pre-creases, and again the collapse phase demonstrated the flexibility of this paper. Even fold lines that intersect with others (resulting in four layers of paper) are handled easily. The last step, the puffing of the triangles, is performed with similar ease. All this was done to check the effect of backlighting. As expected from a white paper the effect is satisfying, with the shadows and the dark grey to white gradient. It is hard to get the final details when you start with a 10cm square. This paper has no will of its own. Like a boneless chicken you have to force it into the right place. It is most evident in the open sink when you try to reverse those valleys into mountains. Near the focal point of all the crease lines, the paper is just mashed. The best part was folding the details at the end. It is a rare occasion when I manage to fold all the hooves, and this time it worked! 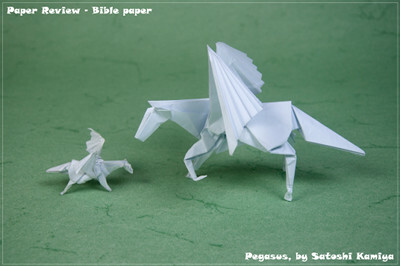 I am quite satisfied with the final Pegasus. Bible paper is good for complex models. It's a strong and thin paper, and as such it holds the creases well. There were no real problems during the process until the finishing details; then I found that the paper became too weak too quickly. I was not satisfied with the final details. Box pleating works well enough. It's a soft paper, you feel it immediately. When you try to reverse a fold, you get little resistance, and no 'snap' feeling. The paper does not tear but leans backwards and you need to guide it with your fingers to the right crease line, otherwise you will make a new one. Squashing, and even worse, sinking, is not performed easily. The paper is a bit like fabric, with too little surface tension. I needed a lot of time to make the talons, with so many sink folds. The tip of the wings went faster, though. The shaping stage was much more successful, as I managed to shape the small details easily (with tweezers here and there). Again, the result is worth the effort! It's not the right paper for modulars. Folding the units is straight forward, unlike the assembly. For this model you must hold all the tabs with clips. Inserting the tabs into the pockets showed the relative weakness of this paper, but the final structure is stable. 3D models hold the posture with ease. Again I tried the recommended size and it seems the paper is comfortably suited to the task. It was easier than usual to make a multi-layered squash fold with the ears. I made curved creases, so that the model would hold its 3D shape stably, and the final model is very pleasing. A thin, strong paper that lasts a long time is a very good starting point. Being so thin it naturally leads one to consider complex models, and our views differ here a little. I found it easy to shape, while Gadi felt the paper became too weak after too little fiddling with the fine details. We both agree that it is well-suited for multi-layered models. 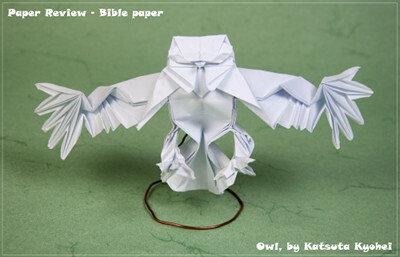 For other uses, it is a solid paper that will satisfy you. Tessellations went surprisingly well and gave good result for this thickness; modulars are not good good candidates, since this paper is neither sold cut to squares, nor in colors. It may also be too thin to hold its own weight. For simple, traditional use it is very good. For action models it is good for pull action, but not for push. 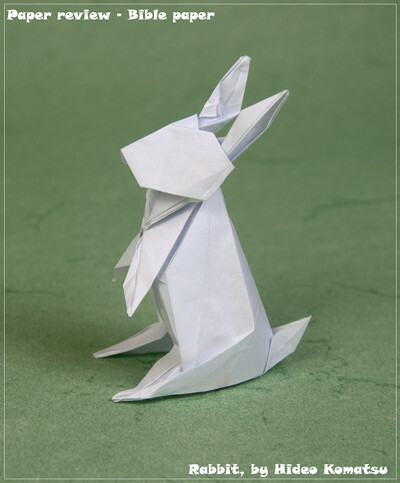 However, I was surprised to see how the 3D rabbit held its posture. 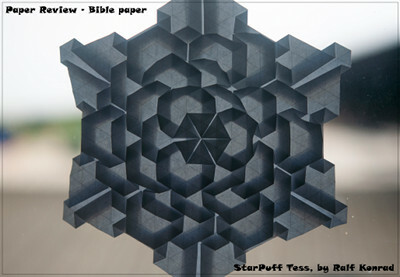 The new Flickr design made it difficult to look for models made from Bible paper and I found only two images; both are tessellations, both presented with back light. Since it is not a common paper, and you have to look for it at a friendly printing press, there is no surprise here.